Hi my name is Bill and I have been a professional painter for over 20 years. I have also done several other renovations such as : installing windows, installing tile, and plumbing to name a few. Hiring contractors for any kinds of home renovation can be difficult for many homeowners, following the right steps can make the job easier. I have done all kinds of drywall repair from framing new walls and replacing old drywall. I have completely gutted several rooms and replaced everything from the tile to the ceilings. I only believe in doing quality renovation work. I strongly believe in doing nothing but quality renovations along with fair pricing. I have spent too much time repairing cheap workmanship. There were times when I thought buying cheaper materials for painting was a good choice. It is always best to take a little extra time and plan out any home renovation. When home owners take the time to thoroughly check reviews and references before hiring any professional, everyone wins. 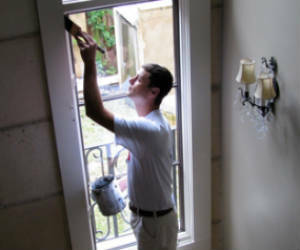 When it comes to home improvements,quality materials and work are a must. Your home is a huge financial investment, It pays to look after it. Some people just don’t have the time to do their own house painting. Why create a big mess of painting cans.Sure,you could paint your home yourself.The question is, can you do a quality painting job? How long is it going to take you also? Time is important.So ask yourself,is it worth it? I would rather hire someone then make a mess.Painting can be a big messy job. Feel free to look around at my other pages for help with the cost of painting your home. It always pays to get quality work. When shopping for the right professional painter remember, you are in charge so make educated choices. Learning how to paint properly takes some practice if you want to do it yourself. Take some time and learn how here. Being a professional painter,I have seen my share of poor workmanship.The reason I made this site was to help others when it comes to painting their home. Take a minute to click like to any of my pages that has helped you with your house painting cost and ideas. If you plan on doing your own house painting,I always suggest quality paint brushes and supplies. Demand high end paint jobs.Learn to make good choices when hiring any contractor.I always tell home owners to find reputable painters that use quality painting supplies also. My house painting profile on facebook. Helping the house painters of the world out. I believe in helping others. If this site helps a few home owners with house painting, then I am satisfied. I do hope to add a section for questions and answers soon to help people even more, until then happy house painting. I will be adding a contact form on here soon for anyone who wishes to receive updates on new paint styles and ideas. I am also hoping to add some more information about general home renovations soon. I try to share as much as I can about house painting and the various prices painters charge. I also share house painting pictures and ideas on twitter.